When the first communication satellite was launched, it was met with pure amazement from people across the globe. The height of innovation, satellite suddenly enabled communication services at a much greater scale than ever before thought possible and quickly became relied upon for a plethora of services. Fast forward to today and the industry we know and love is challenged with competing technologies. Indeed, as new technology is emerging, many have predicted the waning need for satellite. However, the dawn of the next great wave of innovation for this industry is arriving and there are exciting times ahead to help rekindle that love of satellite by users. Ok, so there haven’t been any flames just yet and satellite remains important. However, over the past few years, the satellite industry has been challenged with rising competition from other communication networks. Nowhere has this been more prevalent than the broadcast industry where IP video has enabled the consumer to access the content they want, when and where they want it and on any device. In many regions, the statistics show a decline in linear TV viewing, especially among younger viewers. Given that according to Northern Sky Research, video generates more than 60 percent of total satellite capacity revenues — that is a worrying trend — and not only that, but this trend is also echoed in other user groups. Certainly not willing to take such news lying down, the satellite industry has been picking itself up by innovating and finding new ways to provide services for modern consumers. According to Northern Sky Research (NSR), the emerging space market has received an overall estimated investment of $5 billion in the past 18 months alone, with more than 70 new companies entering the market. This is an indication of a major industry push forward on innovation. 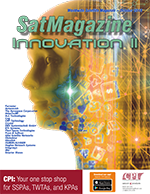 Whether the innovation has been derived because of the challenges facing the industry, or in spite of such, the fact remains that satellite still has an important role to play and innovation is driving the industry forward. At Integrasys, the company believes that satellite should look at targeting the broadcast industry and, in particular, carve out a role for satellite to power IP video delivery. According to NSR’S Wireless Backhaul via Satellite, 12th Edition report, IP Content Distribution could see well over 1.8 million sites serving various use cases deployed by 2027. Currently, satellite is coming into its own. This is partly due to innovation. First, there was High Throughput Satellites (HTS), which meant that even more of the world can be connected at a much lower cost and much more efficiently than ever before possible. By delivering access to much-needed services to more people, satellite has really found an important purpose, especially when addressing Comms-on-the-Move (COTM) and connecting remote communities. The industry is also on the verge of the mega constellation era. There are already more than 1,000 LEO satellites in orbit and thousands more are due to launch during the next five years. These satellites will offer huge amounts of additional capacity and are likely to be key for delivering services. This is particularly important because, over the next few years, an increased demand for global connectivity will be experienced. Consumers want more services than ever before and the connections simply don’t yet exist to provide the connectivity needed for all of these new services, whether for video consumption, WiFi, Internet of Things (IoT), or a plethora of other uses. In particular, IoT will greatly drive both the need and innovation within this industry. According to a recent article from Appinventiv, the IoT market will rise by nearly 20 percent in 2020 to $8.9 trillion. The number of IoT devices will also grow to 31 billion across the globe by 2020, with the number to exceed 75.4 billion devices by 2025. Clearly that is a massive increase and, in order to cope with an increase on that scale, growth must be matched with connectivity options. That is one important reason why satellite will play an important role in IoT. Many have commented that the increase in capacity afforded by the LEO satellites is far greater than current demand. But when you consider how IoT will increase over the coming years, it is apparent that LEO could have a huge part in handling that increase in demand. This also means more than ever that we need to ensure perfect quality of service at all times, even in challenging circumstances. Decent monitoring across networks will increasingly play an important role to ensure that any errors are spotted early and signaled to the network operator before any degradation begins to affect services. The other reason satellite will play a massive role is that some areas of IoT cannot be connected by any other communications method, such as the connected car. Connected cars have long been predicted; however, so far, there hasn’t been much movement in this space. That does look set to change, with Research and Markets predicting that the connected car market will exceed $43,451 million by 2023. Keeping cars connected will be a significant challenge and one that can only really be addressed using satellite technology. Consumers, used to have a connection, will not have patience for the connected car becoming just “car.” That said, the satellite industry has for many years been providing COTM connections that must work with no intervention from satellite engineers. Most ships, for example, don’t have engineers on board. For that reason, there has already been a great wave of innovation, something Integrasys is proud to be a part of, enabling automated pointing for example. Being able to automatically point to the correct satellite and keep that connection will be absolutely crucial in the connected car environment. It will also be important that connected cars can troubleshoot themselves when problems arise and take steps to fix any errors automatically. At the same time, giving the network operators the means to properly monitor entire fleet of cars and troubleshoot from the NOC, further reduces any input needed from the consumer. Innovation is delivering in a new dawn for satellite, both in innovation in the form of new and engaging services for consumers that need to be powered by satellite, and innovation within the satellite industry that is introducing new technology and automated tools. All of this means that, rather than leaving the comms markets to other technologies, satellite still has an important role to play. However, in order to maintain that relevance, the industry will need to adapt to the new communication requirements that users have and will continue to demand in the near future — the industry taking advantage of the new innovations. Alvaro Sanchez is General Manager at Integrasys and is responsible for Integrasys’ three offices (Madrid, Washington DC, and Seville) and guides the company strategy through daily tasks with the respective company teams. Before this role Alvaro was responsible for the Sales Department, providing the most innovative solutions for satellite operators and service providers, in the VSAT market for commissioning & maintaining the network automatically. Prior to joining Integrasys, Alvaro was a signal analysis expert at the largest collider worldwide, CERN European Organization for Nuclear Research, Switzerland, where he was working testing synchronization equipment for measuring if the accelerated neutrons could pass the speed of light.